At Heather Hills Farm, we believe in creating award-winning, handcrafted, luxury preserves whilst ensuring the survival of the honeybee and their essential work in pollinating the world’s food crops. Only the finest local Perthshire raspberries - pollinated by our own bees who gather the nectar to make our Scottish Blossom Honey - are carefully handpicked and selected and then gently stirred in traditional open pans with raw cane sugar to lovingly handcraft a world-class, award-winning artisan preserve bursting with dark red, luscious, sweet fruit and an authentic, intense flavour. 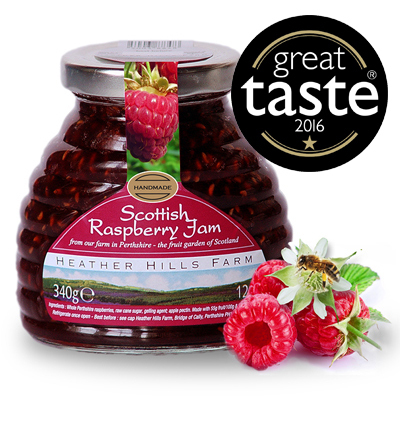 With a minimum of 50% fruit, this is a luxurious, extra fruit jam which is a real Scottish favourite. Only when each batch - which is hand bottled and labelled - is signed off by our Master Jam Maker, are we happy to put our name to it. We never add anything artificial - no added preservatives, artificial flavours or colours. We believe you deserve the best - since 1945. Ingredients: Raspberries, Cane Sugar, Lemon Juice, Gelling Agent (Fruit Pectin, Dextrose). Nutritional Information (Typical Values per 100g): Energy 1097kJ/258kcal, Fat 0.3g (of which saturates <0.28g), Carbohydrates 63.2g (of which sugars 57.5g), Protein 0.6g, Salt <0.1g.